The Trump administration is facing a lawsuit for its lack of transparency on its plan to reorganize federal agencies and reshape their workforces, with one group saying documents related to those plans should be released as public records. Specifically, Public Employees for Environmental Responsibility is suing the Office of Management and Budget for the submissions made by the public in response to an executive order signed by President Trump in March and ensuing guidance from OMB. 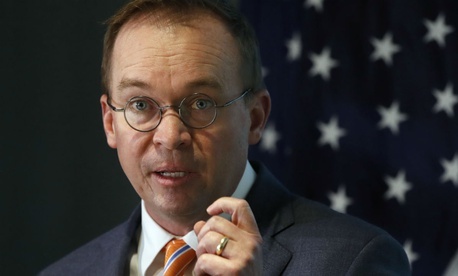 Mick Mulvaney, the OMB director, personally called on American citizens to weigh in with ideas for “making the federal government more efficient, effective and accountable to the American people.” OMB subsequently set up a website for the public to submit those ideas, and later said it had received more than 100,000 submissions and distributed them to relevant agencies. “After the suggestions were counted did anyone bother reading them?” he asked. He speculated the administration created the public solicitation merely as “a cover” for instead adhering to whatever recommendations came from industry and “commercial interests” that are now increasingly represented inside government through political appointments. Rep. Elijah Cummigs, D-Md., the top Democrat on the House Oversight and Government Reform committee, has asked Mulvaney for copies of the reorganization plans themselves. Agencies turned over initial versions of their plans to OMB in June and final drafts in September. Lawmakers have not yet viewed the proposals and said they do not know if agencies met their deadlines. The Trump administration has said it will unveil the plans publicly when it releases its fiscal 2019 budget proposal. Efforts by Government Executive to obtain copies through Freedom of Information Act requests were denied, with the administration citing the deliberative process as the reason. "The degradation of the federal workforce—particularly among those who dedicate their lives to protecting our national security, our environmental safety, and our health and wellness—should not occur in darkness,” Cummings said in his December letter. If PEER is successful in its lawsuit, then Ruch said his group would analyze the submissions and display them publicly. “We would perform the functions that we thought OMB would perform,” Ruch said, adding PEER would look to see if the administration heeded any of the public’s advice. Having to file a lawsuit to track that information, he said, is nothing new. “The Trump administration appears to be completely allergic to transparency,” Ruch said. OMB did not respond to questions about the lawsuit or whether it would release the records.